Figure 1. The electrophysiology laboratory. These are fast heart rates and can be divided into supraventricular tachycardia if arising from the top chambers of the heart or ventricular tachycardia if they arise from the lower chamber. The diagnosis can usually be made on an ECG (electrocardiogram) but it requires an electrophysiological (EP) study to locate the exact origin of the tachycardia in order to eradicate the problem. 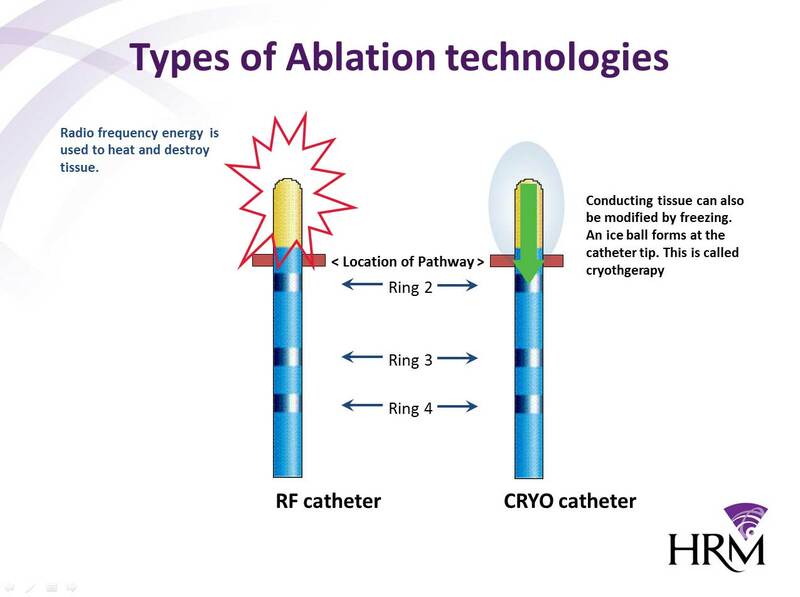 This is done in an electrophysiology laboratory and the process of eliminating the abnormal circuit is referred as an ablation. 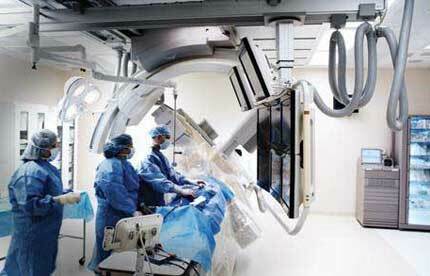 The electrophysiology laboratory is a sterile environment where catheters are steered up to the heart through a vein or artery in the groin under X-ray guidance. The exact location of the of the cause of the tachycardia can thus be identified. 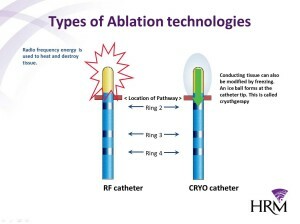 This is then ablated using either by heating or freezing the tissue through a specialised catheter. Radio frequency energy is used to heat and destroy tissue. Conducting tissue can also be modified by freezing. An ice ball forms at the catheter tip. This is called cryotherapy. Ablation of the underlying heart myocardium using a special ‘irrigated’ catheter. The electrophysiologist relies of a host of computer systems that process the electrical activity from the heart in order to navigate to the origin of the problem. 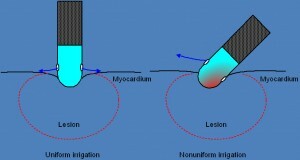 This is vital in order to perform the ablation at exactly the correct area. Ideally the tachycardia or fast heart should be induced in the EP laboratory to accurately diagnose the problem and to locate the abnormal circuit. A recording system is shown on the left while sometimes a mapping system is require for a more detailed navigation of the chambers of the heart. 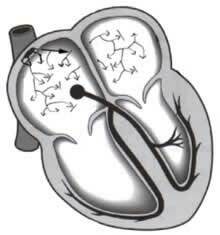 Normal conduction of the heart starts with an impulse generated from the natural pacemaker of the heart called the SA Node situated in the top right hand corner of the right atrium. This tells the heart at what rate to beat at. The impulse then conducts down to a structure called the AV Node to the lower chambers called the ventricles. There is usually no other means for these impulses to reach the lower chambers as the valves that divide the upper and lower chambers act as a insulation barrier. This is to protect the lower chambers from being driven too past by the SA node. This is one of the most common SVTs, occurring in both older and younger patients. 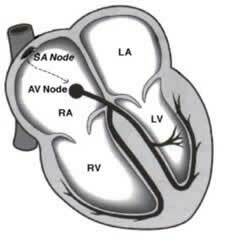 The circuit causing the tachycardia is related to having a slow pathway within the AV node. This essentially results in a short circuit within the AV Node. It is successfully treated with an ablation standing a greater than 90% chance of curing the problem. However there is a small 1% risk of damaging the normal pathway and the patient needing a pacemaker. The WPW (Wolff-Parkinson-White) syndrome is also a common cause of a SVT. It is caused by an accessory pathway or additional strand of conducting fibres across the insulated valve rings between the upper and lower chambers of the heart. These are potentially dangerous pathways which can cause a cardiac arrest. 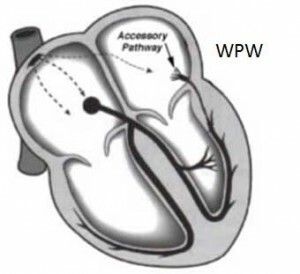 WPW is also successfully treated with an ablation successfully eliminating the problem. 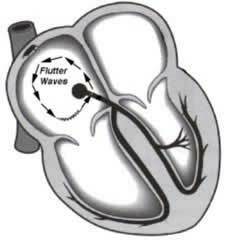 Atrial flutter is an SVT that has a wide circuit than more commonly lies in the right atrium. By interrupting the flutter circuit with an ablation, the SVT is prevented from ever recurring. This saves the patient the need to be on constant medication to slow the heart rate down as well as blood anticoagulants to prevent a stroke that this condition can predispose a patient to. Atrial fibrillation is the most common arrhythmia in man, effecting millions of people worldwide. In a select group this is primarily caused by trigger cells lying within the pulmonary veins which bring blood from the lungs back to the left atrium of the heart. In this patient group we are able to either cure or dramatically improve symptoms by ablating around these pulmonary veins preventing the trigger cells from activating atrial fibrillation. 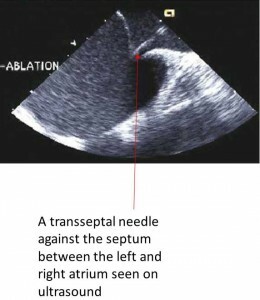 Since the pulmonary veins enter the left atrium, a procedure called a transseptal puncture is performed in order to reach the veins with a catheter. 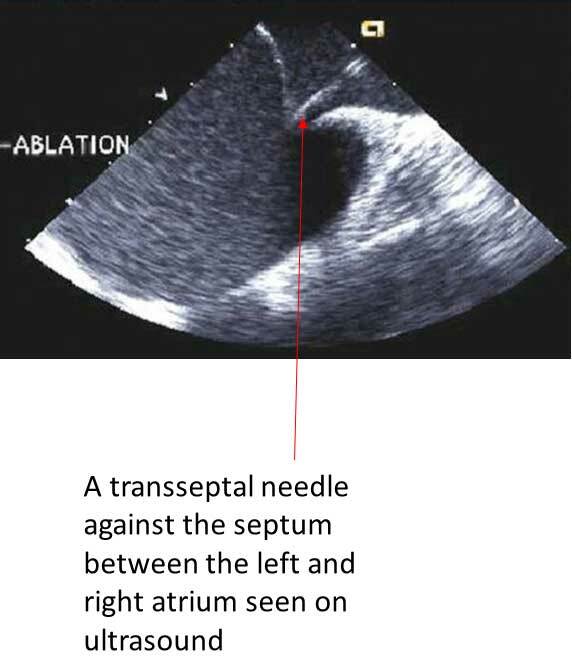 A needle is advanced from the groin to the septum between the left and right atrium. A safe painless puncture is performed under ultrasound guidance.